Bracelets that communicate your location to a central computer. Jackets with “soft” button controls to lock and unlock your front door. Antennas woven into military uniforms. Shirts with built-in heart and perspiration monitors. These are only a few examples of the fusion of clothing and computing, known now as “wearable technologies.” Innovative, invasive, and intriguing, devices like this are becoming part of our everyday existence. Recent discourses about Cyborgs often revolve around the ramifications of enhancing human capabilities—memory, intelligence, vision, and the larger topic of genetically engineering specific traits. 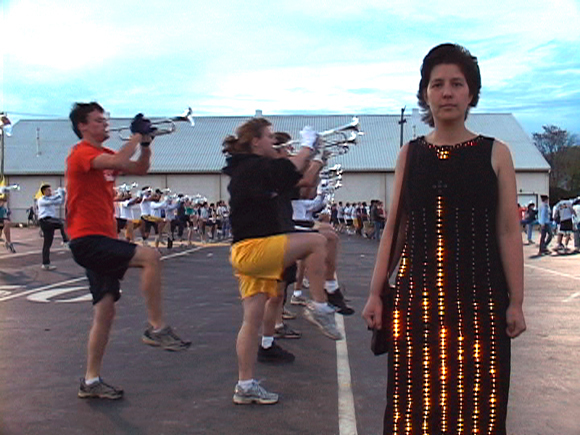 In contrast to both of these, Wired Wear takes a playful and critical look at wearable technologies by providing humorous and poetic interventions into these disciplines.